Last week I was asked whether I could produce a script that would keep track of Carbon Copy Cloner backup tasks so that a user could tell which of many, multiple backups of the same source disks were the most recent. Of course, CCC has its own Task History and Disk Center functions to provide information, but these turn out to be insufficient in common scenarios. To see why, let’s consider a hypothetical task set-up and recovery situation. 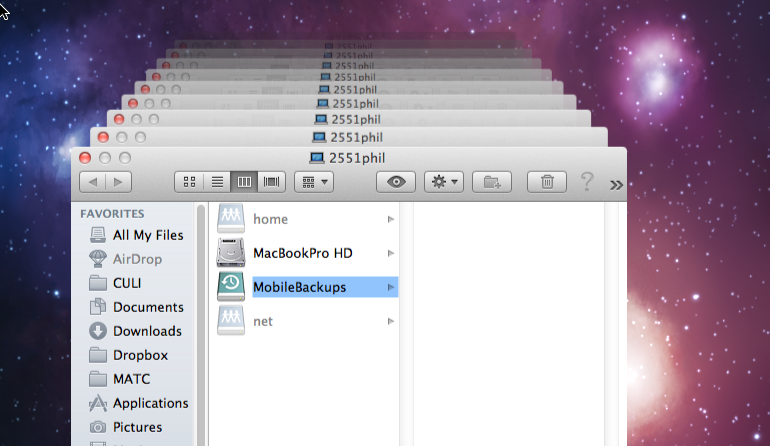 In this situation, let’s suppose I’m keeping 2-hourly, daily and weekly clones of my mac’s internal disk. While I’m logged in to my mac, I can of course check CCC’s Task History to see when the last back up was, the destination, and whether it was successful or not. However, suppose the internal disk fails – just the situation for which I keep my CCC backups on a regular schedule. Which disk contains my latest backup? The information from CCC’s history task is on the failed internal disk, so it is not now available to me. Of course, each backup contains CCC’s earlier History too, but there’s several problems here. First, these cloned task histories do not contain the history from the *last* task (that’s only written to the source disk after the last backup completes). Second, to compare them, I’d have to boot each clone individually – a time-consuming and not terribly convenient process. Third, CCC’s ‘Disk Center’ only provides backup information about connected disks if the current startup disk was used to run the backup task. Thus, if I backup Disk B from Disk C, that information won’t be available to me when I startup my mac with Disk A.
Fortunately, CCC has two features which make our problems solvable. First, each source disk keeps detailed logs of the backups it has run (from which the Task History and Disk Center info is constructed); secondly, CCC allows us to run a shell script after each task has completed. These two little features are going to allow us to build a shell script that will write a special log file to the destination after each task completes, and then retrieve it and compare it against both the current source and other disks. That means we’ll be able to get CCC backup data from any disk we connect to any mac, since the data will be stored on the destination disk itself thanks to our shell script (for the technically minded: to avoid permissions problems, the script writes to /Users/Shared/ if it’s a bootable clone, or to the root of a disk that isn’t). That’s the outline of the problem and the solution. What started out as a simple AppleScripting task soon blossomed into a full-blown app. Although much of the background work I’ve outlined above is achievable via AppleScript, displaying the data effectively is rather cludgy, even if one uses some of the excellent scripting libraries like Shane Stanley’s ‘Myriad Tables’ to improve on the stock AppleScript offerings. For full instructions refer to the Support page, but the basic idea is that on first launch, you run the ‘Set Up’ wizard to configure your tasks in Carbon Copy Cloner. Disk Inspector’s ‘Set Up’ wizard walks you through 5 simple steps to accomplish all this. Once you’ve completed the set up procedure and each of your scheduled CCC tasks has run, you’ll start to see information for each backup disk in Disk Inspector’s main view on any mac (or on the same mac booted from a different drive) that you subsequently connect those disks to. Disk Inspector runs on 10.10 and higher. Time Machine – anywhere, anytime! 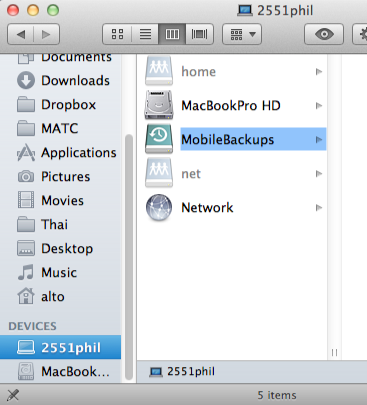 One of the nice new features of OS X Lion is that you can access your Time Machine backups even when you are disconnected from the drive such as on the commute to work or even while on holiday. The downside is it takes up a chunk of your HD that you might not want to give up. Fortunately, you can turn this feature on or off (it’s on by default in Macbook’s, but off by default in iMac/Mac Pro). When the feature is on, local snapshots of the last few days’ Time Machine backups are stored on a local drive called MobileBackups. If your time machine backup disc should get corrupted for any reason, these can also serve as a second line of defence. Be careful though, these backups get replaced and updated without warning, so don’t rely on them for anything more than the last couple of days saves. You can access these from the regular Time Machine icon. Alternatively, find them by clicking on the computer name at the bottom of the left-hand column in any Finder window, and then navigating to the MobileBackups drive. followed by your admin password and a return-key stroke (don’t expect to see anything when you type the password). If Terminal returns to the prompt you should be good to go. 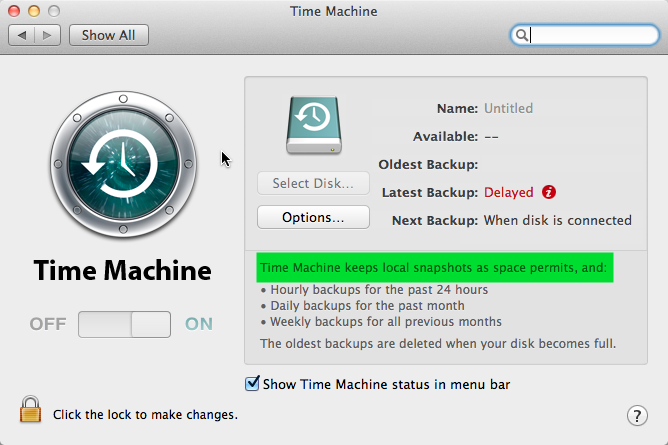 Check by opening Time Machine preferences, which should now display the message that “Time machine keeps local snapshots as space permits and…” followed by the Time Machine backup schedule. If it hasn’t worked, it’ll just say “Time machine keeps:” and then the schedule. followed by your password. Don’t forget to quit Terminal straight after you’ve verified everything’s working. Enjoy! Comments Off on Time Machine – anywhere, anytime! Since OS X Lion is only available via download from the App store, you may be wondering what to do if you need to recover the whole OS. In times past, you’d simply insert the original CD/DVD that the OS came on, but how do you do this if the OS is download only? 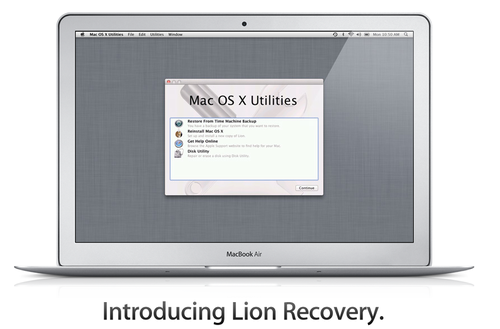 Apple has provided a couple of different ways of effecting a full recovery of Lion. In most cases, so long as you are connected to the internet either by Wifi or ethernet cable, you can simply restart your machine while holding down the Command key and the ‘R’ key on the keyboard (Cmd-R). This will put your machine in recovery mode, and you can follow the instructions from the start up screen. Initially, your machine will try to recover from a special Recovery partition that Lion created on your hard disc when you originally installed it. However, if your HD is corrupted or unavailable for some reason, Lion will attempt to recover the OS directly from Apple’s servers. In both cases, be aware that you need an internet connection. If Lion cannot re-install on your internal disc, or if you want to move the OS to a new or external disc, you will need to go through a few preparation steps. To learn about these and more about Lion’s recovery options, see the full Apple support article here.